Bidirectional prosthetic-brain communication with light? By resorting to modern imaging tools, hundreds of neurons in the surrounding area could also be observed as the mouse learned the neuroprosthetic task. “We know that millions of neural connections exist. However, we discovered that the animal activated only the one neuron chosen for controlling the prosthetic action, and did not recruit any of the neighbouring neurons”, adds Daniel Huber. “This is a very interesting finding since it reveals that the brain can home in on and specifically control the activity of just one single neuron”. Researchers can potentially exploit this knowledge to not only develop more stable and precise decoding techniques, but also gain a better understanding of most basic neural circuit functions. It remains to be discovered what mechanisms are involved in routing signals to the uniquely activated neuron. This entry was posted in human enhancement, light, medicine and tagged Brain Machine Interface, Daniel Huber, electrode approach, Gregorio L. Galiñanes, Mario Prsa, modern imaging and optical stimulation tools, motor function, neural activity, neural circuit mechanics, neural prosthesis, neuronal activity, neuroprosthetic movements, proprioception, prosthetics, Rapid Integration of Artificial Sensory Feedback during Operant Conditioning of Motor Cortex Neurons, sensation of where limb is located in space, Switzerland, two-photon microscopy, Université de Genève, University of Geneva (UNIGE) on March 20, 2017 by Maryse de la Giroday. Two OrthoCarolina hand surgeons have successfully completed the first surgery to allow for a prosthetic hand with individual finger control on an amputee patient. Partnering with OrthoCarolina Research Institute (OCRI) in pursuit of medical breakthroughs through orthopedic research, Drs. Glenn Gaston and Bryan Loeffler conceptualized and performed the procedure involving transferring existing muscle from the fingers to the back of the hand and wrist without damaging the nerves and blood vessels to the muscles. 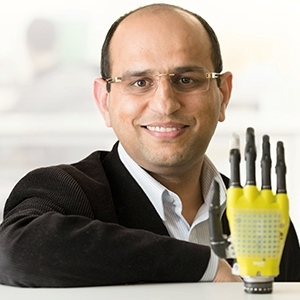 The patient who underwent the test surgery is now able to control individual prosthetic fingers using the same muscles that controlled his fingers pre-amputation, making him the first person in the world to have individual digit control in a functioning myoelectric prosthesis. Hypothesizing that existing muscle in the back of human fingers could be transferred to the back of the hand and wrist without damaging the nerves and blood vessels to those muscles, Drs. Gaston and Loeffler first performed cadaveric testing to ensure feasibility. 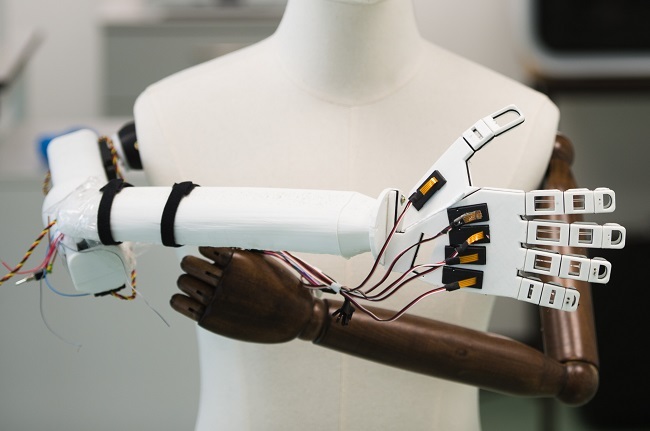 The goal of the initial project was for the small muscles that control individual fingers to regain control of prosthetic fingers by maintaining enough blood and nerve supply to allow the prosthetic limb to recognize individual digits. With successful research completed, they collaborated with the Hanger Clinic to determine how much bone would be required to be removed from the hand, allowing the prosthetic componentry enough space to maintain a normal hand length. The two surgeons jointly performed the surgery as a pilot case on a partial hand amputee, moving the muscles while still allowing the prosthesis to detect signals from the transferred muscles; a procedure never before reported in orthopedic literature. Drs. Loeffler and Gaston have completed a cadaver model demonstrating the capability of the same type of surgery for a more proximal level total hand amputation. They presented their research at a podium presentation to the First International Symposium on Innovations in Amputation Surgery and Prosthetic Technologies (IASPT) May 12-13, 2016 in Chicago. OrthoCarolina Research Institute is an independent non-profit committed to the advancement of orthopedic practice through clinical research. OCRI will continue to support this ground-breaking research and the manufacturing of this cutting edge prosthesis. “This is a tremendous example of the life-changing impact that orthopedic research plays in advancing patient outcomes,” said Christi Cadd, Executive Director of OCRI. You can find out more about OrthoCarolina here. For those unfamiliar, the lifelike artificial legs and arms that hang on the Museum of Vancouver’s wall might seem like medical oddities from a less advanced era. But for collector David Moe, a certified prosthetist, they are integral, inspiring pieces for his career, his teaching, and his workspace. “I love them all,” he says with enthusiasm, standing in the museum’s giant new exhibit All Together Now: Vancouver Collectors and Their World, in a corner of an expansive, cabinet-of-curiosities-styled room that houses everything from scores of local Chinese-restaurant menus to rows of 19th-century corsets and a glass case full of hundreds of action figures. “It’s very strange because they have been all around me for so long and they have sat in predominant spaces at work—they sit on the top of a shelf. So when I walk back in there right now there are these kinds of empty holes. Moe began collecting almost from his start, at the age of 14, when he worked sweeping floors and pouring plaster at Northern Alberta Prosthetic & Orthotic Services, his family’s business in Edmonton. One of his first big finds was a leg that sits in the exhibit today—a meticulously carved wooden limb covered in smooth skin-tone leather, dating back to the 1930s. At the time, he recognized the craftsmanship and tucked it away where it wouldn’t disappear; today he still marvels at the anatomical design, with a hinged knee that bends with the use of straps. To show how far his specialty has come, though, Moe has juxtaposed the historic limbs with modern-day advances—decorative limb coverings with fashionable latticework, or a kids’ shin piece that’s been emblazoned with a comic-book image of Superman. Now, instead of trying to just mimic natural limbs, some people are opting for statement pieces that actually draw attention to their prosthetic. “This empowers them in this powerless situation where someone has amputated your leg,” he notes. As with other exhibits in All Together Now, there are audiovisuals that accompany his collection—in this case showing people using the advanced limbs of today, from a female triathlete carrying her baby to another client playing competitive volleyball. “When someone does the Grouse Grind or, hell, just walks their child down the street, that’s when they come alive. We’re rebuilding lives, not pieces,” Moe says. All Together Now: Vancouver Collectors and Their Worlds features 20 beautiful, rare, and unconventional collections, with something for everyone including corsets, prosthetics, pinball machines, taxidermy, toys, and much more. In this exhibition both collector and collected are objects of study, interaction, and delight. The exhibition runs until January 8, 2017. The last Thursday of the month is by donation from 5 pm to 8 pm. More information about admission can be found here and you might also want to check out the exhibition’s Events page. This entry was posted in Vancouver and tagged 2016 International Symposium on Innovations in Amputation Surgery and Prosthetic Technologies (IASPT), All Together Now: Vancouver Collectors and Their World, British Columbia Institute of Technology (BCIT), Bryan Loeffler, Christi Cadd, David Moe, First International Symposium on Innovations in Amputation Surgery and Prosthetic Technologies (IASPT), Glenn Gaston, Janet Smith, Museum of Vancouver, myoelectric prosthesis, Northern Alberta Prosthetic & Orthotic Services, OrthoCarolina, OrthoCarolina Research Institute (OCRI), prostheses, prosthetic hand with individual finger control, prosthetics on June 29, 2016 by Maryse de la Giroday. In a hidden room in the back of a pier overlooking the San Francisco Bay, a young girl shoots glitter across the room with a flick of her wrist. On the other side of the room, a boy is shooting darts from his wrist – some travelling at least 20ft high, onto a landing above. It feels like a superhero training center or a party for the next generation of X-Men and, in a way, it is. I searched the Project Ignite website using the term ‘superhero cyborg’ and did not receive a single hit. I also used the search term on the Instructables website and got many hits but did not see one that resembled any of the project descriptions in Price’s article. Unfortunately, Price did not offer any suggestions for search terms. Jordan [Jordan Reeves, a 10-year-old from Columbia, Missouri] was born with a limb difference: her left arm stops just above the elbow. When she found out she was headed to the Superhero Cyborg workshop, she was over the moon. “I was like, ‘Wow, I can’t believe I’m actually doing this,'” she says. The workshop is over now but the children will continue for a few months working on their designs and, in some cases, creating prostheses that can have practical applications. We promote an energetic, hands-on approach to learning – our workshops create an immersive environment of moving, shaking, sketching, whirling, splatting, slicing, sawing, jitterbugging creativity. When we are not swimming in post-it notes, we like to explore all kinds of technologies, from pencils to circuitry mills, as tools for creative expression. This entry was posted in human enhancement and tagged Autodesk, Emily Price, Instructables, Jordan Reeves, Kate Ganim, KIDMob, Project Ignite, prosthetics, Sarah O’Rourke, Superhero Cyborgs on March 30, 2016 by Maryse de la Giroday.